UPDATED: Mon., April 8, 2019, 1:39 p.m.
CAPE CANAVERAL, Fla. – Spacewalking astronauts completed battery and cable work outside the International Space Station on Monday despite communication trouble that sometimes made it hard for them to hear. During the spacewalk, Canadian astronaut David Saint-Jacques reported that U.S. astronaut Anne McClain’s voice was faint at times. The problem worsened as their 6 1/2-hour excursion drew to a close. “We know that it’s a lot of hard work and a lot of big sighs of relief as soon as this hatch gets closed,” McClain said once the pair were inside the air lock. Earlier, McClain and Saint-Jacques hustled through their part in battery swap-outs that began last month. It was the third spacewalk in just 2 1/2 weeks for the space station crew. The cable routing took more time, providing a backup power circuit for the station’s Canadian-made robot arm and expanding wireless communications. 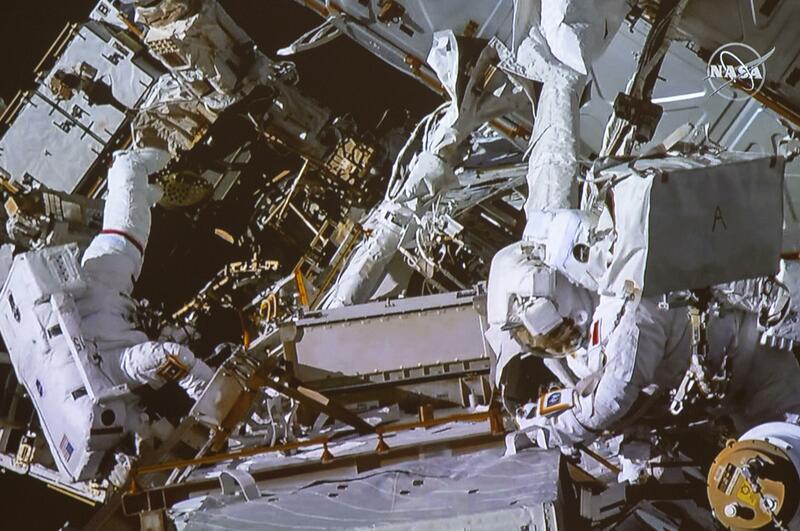 At one point, the spacewalkers had to use a pry bar to loosen a stuck fastener and get behind a protective panel. Last week, flight controllers used the space station’s robot arm to remove the failed battery along with an associated charging device. Working remotely, the controllers also installed a spare charging device and one of the old batteries made of nickel hydrogen. The second outdated battery will go in – robotically – later this week. Published: April 8, 2019, 12:38 p.m. Updated: April 8, 2019, 1:39 p.m.